Emilia Clarke stopped by “The Tonight Show Starring Jimmy Fallon” yesterday to promote the new season of the HBO hit show “Game of Thrones”. They talked about Madonna dressing up as Daenerys Targaryen, played by Emilia Clarke. Emilia Clarke: That’s just me… She’s doing really well. 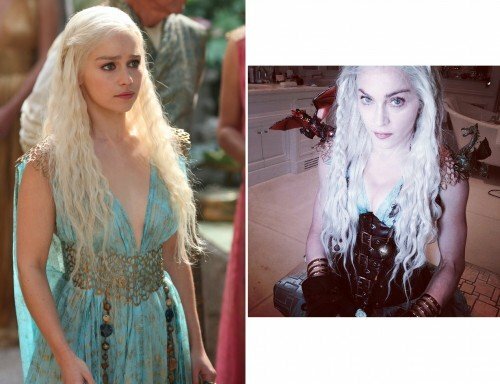 Emilia Clarke: Yes, it’s my real costume. I was like, this must be a dream. Yes, she did [put it on]. I believe the harness might be hers. Jimmy Fallon: Those aren’t your little baby dragons are they? Jimmy Fallon: Madonna, will you call Emilia please? Emilia Clarke: Please can I have them back? [laughs] I’ve been looking for them everywhere!